Several ingredients commonly found in barbecue sauce are high in FODMAPs. This is by no means a full list. 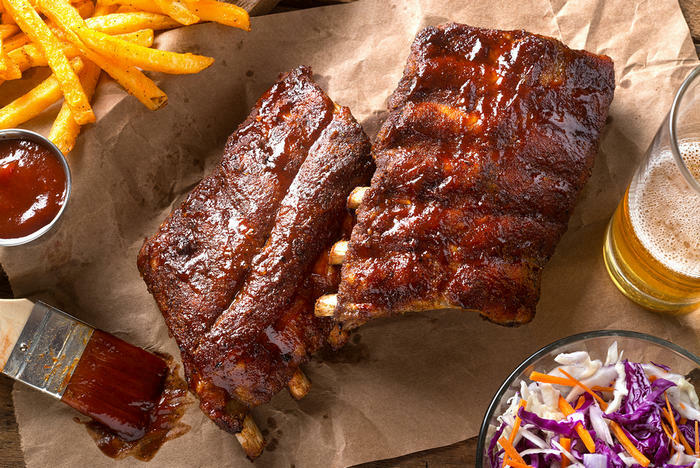 High fructose corn syrup is very common in barbecue sauces. It’s often the first ingredient on the list! For example, two of the three slow-simmered Kraft barbecue sauces I checked had high fructose corn syrup as the #1 ingredient. The idea of slow-simmered high fructose corn syrup isn’t that appealing, is it? One ingredient that is often found in barbecue sauce that is OK is apple cider vinegar. While apples are not ok on the diet, apple cider vinegar is fine in reasonable quantities. I haven’t found any FODMAP-friendly barbecue sauces at my local store, but Fody Foods sells one through its online store. It’s a bit runnier than I prefer, but it has great flavor. If you find any barbecue sauces as your grocery store or online that might work on the diet, please send us a note.